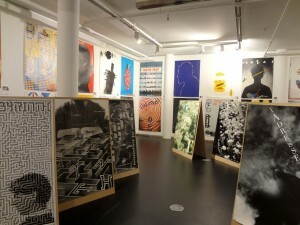 SFDW 2015 recently checked in with internationally renowned Swiss graphic designer Jean-Benoit Levy, who recently exhibited 101 Swiss Contemporary Posters, a collection featuring work created by himself and 30 other Swiss design studios. Levy, who now lives in San Francisco, says the collection pays homage to his native Swiss discipline of design. Levy is known for his uniquely expressive and iconographic posters that use photography, bold typography, and dynamic colors and shapes, to create rich information and stories for passersby in urban spaces, and this most recent collection of work is no exception. His collection has posters spanning three generations, including Levy’s most recent work for 101 Swiss Contemporary Posters, past work from Levy, designs from predecessors and teachers of his, as well as posters from rising Swiss graphic designers and collectives. The ‘101’ posters are made up of 41 original posters by Jean-Benoit Levy and two posters for each of the 30 invited graphic designers. And while the designs span from the modern to the vintage, all of the pieces are united by their form and their unique approaches towards it. According to Levy, the collection aims to accompany and guide the viewer through specially selected works from three generations of the most influential poster design. 101 Swiss Contemporary Posters encompasses the last 50 years in design starting with the 1960s when Swiss design established its distinct international style that is both celebrated and reappropriated today, thanks to the work of designers like Levy.